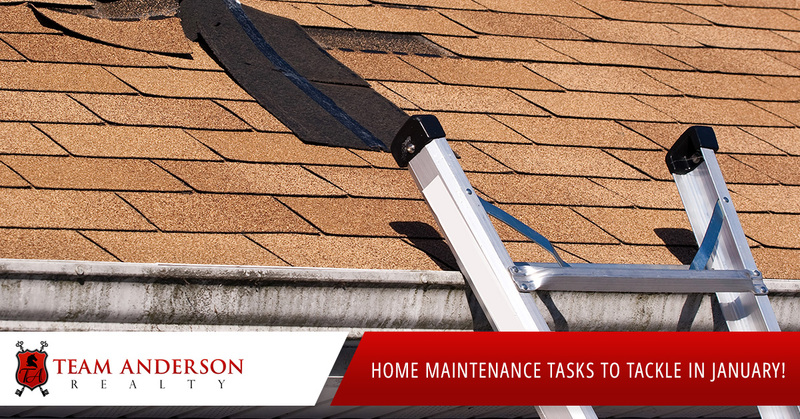 Home Maintenance Tasks To Tackle in January! Home maintenance tasks aren’t going to be any easier at the start of a new year than they were during the holiday bustle of December. You’ve winterized your home against the cold, and it’s now the dead of winter. Still, homes must be maintained, even in January. It’s always easier and cheaper to do home maintenance than to repair a home – that can sometimes cost thousands of dollars. Below is a handy checklist of home maintenance tasks that need to be completed in January – plus tips on how to do them faster and easier, or with the help of a professional. So take a deep breath and dive into these chores. The good news? Many of these are inside chores, so you have no “It’s too cold!” excuses. Task: You’ve had the fun, and now it’s time to get rid of the evidence. Take down holiday lights and wrap them around a hanger to prevent tangling. Set the over to self-clean, then wipe the interior with a vinegar-soaked cloth. Chip your Christmas tree and throw it in a compost pile, or scatter it around your garden beds and shrubs for a midwinter mulching. Shortcut: Instead of pitching holiday cards or tucking them away never to be seen again, recycle them into gift tags for next year. Find a pretty part of the card that has no writing on the back, cut it into a small square, and punch a hole in the corner. Call in the Pros: If you’ve ever considered a cleaning crew, now’s the time. Figure on paying $200-$300 for a one-time cleaning. Ask friends who have a regular cleaning person to share the name of their recommendations. Task: Prevent exposed pipes from freezing as temperatures drop. A frozen pipe can crack or burst, flooding your home. If you’re planning a winter vacation, don’t forget to wrap pipes with heat tape you can control with a thermostat. If you haven’t turned off water to outdoor spigots yet, consider yourself lucky, shut off water valves and open spigots to drain existing water. Shortcut: To thaw a frozen pipe, wrap it with a heating pad or turn a hairdryer on it. Call in the Pros: If a pipe bursts, shut off the main water valve to your home and call a plumber, which will run anywhere from $45 to $150 per hour. If everything is drenched, a water remediation or restoration company can perform cleanup; cart away damaged material, replace ceilings and walls, paint, and reinstall plumbing fixtures, which is around $23 per square foot. Task: After winter storms, your home maintenance routine should include and inspection of your home’s roof, siding, gutters, and yard for wind, snow, or ice damage. Shortcut: Instead of climbing on the roof to look for missing shingles, use binoculars to search for damage. Better yet, buy a drone that can fly over your house and spot damaged areas. Call in the Pros: A little storm damage can become a big problem if you don’t make immediate repairs. A roofing company can inspect and replace a few shingles for $95 to $127. A handyman can reattach hanging gutters for $171 to $492. An arborist can remove cracked tree limbs and prune trees for $375 to $525. Task: Yes, cleaning counts as home maintenance! Clean those filthy places that people don’t see but you know are there. They include the range hood and grilles, refrigerator coils, tops of ceiling fans, dusty light fixtures and bulbs (make sure lights are off before dusting), and HVAC vents. Shortcut: Let your dishwasher clean metal parts such as vent grilles and range hood filters. You can pop dirty sponges and dishrags in the dishwasher too. Call in the Pros: This deep cleaning is above and beyond the tasks that cleaning crews normally perform. If you want a crew to do this type of cleaning, negotiate the surcharge up front. Task: Shine and tighten doorknobs and hinges; tighten loose cabinet pulls and nobs, and level cabinet doors. Shortcut: To clean metal hardware, wash with soapy water, then shine with a microfiber cloth dipped in vinegar or lemon juice. Brass polish will remove tarnish from solid brass hardware. Not sure it’s brass? If a magnet sticks, it’s most likely metal, not solid brass. Call in the Pros: If you’re going to take off hinges and locks, hire a handyman (those doors are heavy). Prices vary widely, and some handyman services chard $125 an hour for skilled jobs. Cleaning hardware is more tedious than skillful, so don’t pay more than $30 to $60 an hour. Task: Banish piles, clean out closets and drawers, and tackle the basement if you can stand it. Channel your inner Marie Kondo; if you haven’t touched something in a year or don’t love, then you should toss, donate or recycle it. Shortcut: If you can’t face a total house de-clutter, do little bits over a few days. Pick one room or a corner of the room to organize. Or, every time you walk into a room, put/throw one thing away. Call in the Pros: Professional organizers take no prisoners when de-cluttering your home and setting up systems to keep things nice and tidy. This tough love doesn’t come cheap. A professional organizer costs $30 to $80 per hour, and the average room takes 8 to 10 hours to organize. Task: If you can’t deal with the January gloom, you can always look ahead to spring. Home maintenance extends beyond the actual home too; grab those seed, bulb, and bare-root plant catalogs, and start planning your flower and vegetable gardens. If you’re starting seeds inside, plant them about six weeks before the last frost in your area. Shortcut: You’d be amazed by how much produce you can grow in raised-bed or container garden. There’s no hoeing, raking, or digging. Create your own weed-free soil by mixing one-third vermiculite, one-third peat moss, and one one-third varied compost. Call in the Pros: A professional landscape designer, who designs gardens and suggest plants, costs $50 to $100 per hour. Some garden centers will give you free design advice if you buy plants there. Also, seed catalogs often have free garden plans.